You are viewing the archive for the ‘Step by Step Turkey Roasting’ tag. On the fourth Thursday of every November, everyone who believe themselves to be Americans celebrate nature’s bounty by feasting with their loved ones. Traditional thanksgiving food is simple baked, boiled, and/or mashed, and served with minimum spices to ensure soft texture and mild flavor that cater to anyone from children to elderly. Partaking in this meal is a symbolic gesture for every immigrant who becomes an allegorical descendant to the generation of pilgrims who first ventured out to the New World with a hope of a better life. Essentially, the fourth Thursday of November is more American than the fourth day of July celebrated with barbecues. Most immigrants celebrate thanksgiving meal interwoven with culinary tradition of their heritage. 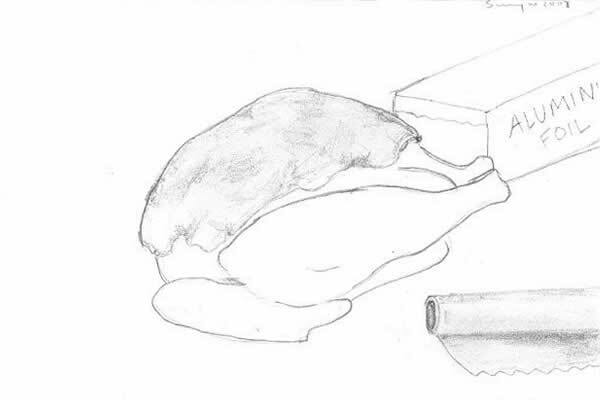 North American bird, turkey, symbolizes their new home in America, while the additional spices and dishes represent their contribution to the melting pot. 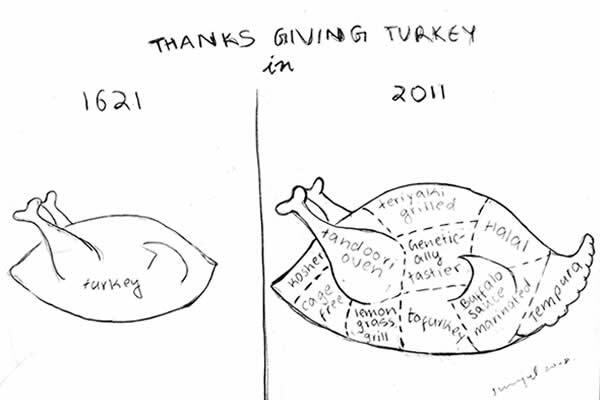 How was Thanksgiving started by immigrants? The overtly rehashed story of Thanksgiving starts with the new immigrants, Pilgrims and their native American Wampanoag neighbors feasted together in October of 1621 as a gesture of gratitude for having food on the table. Coincidentally, Canada started celebrating its thanksgiving in second Monday of October since 1950s. George Washington, John Adams, and James Madison issued proclamations of a thanksgiving holidays. However at that time states celebrated thanksgiving at different times with its popularity remaining limited to New England with lukewarm celebration in the Southern states. Thanksgiving was not a national holiday until the proclamation by Abe Lincoln in 1863. Ironically, Lincoln got his inspiration from Sarah Josepha Hale, famous for writing nursery rhyme “Mary had a little lamb”, who championed the cause for a unifying national holiday that would foster unity in a nation at the brink of a civil war. Lincoln envisioned “a day of Thanksgiving and Praise” for “these bounties, which are so constantly enjoyed that we are prone to forget the source from which they come” as said by Lincoln in his proclamation. The tradition of having turkey for Thanksgiving may have start in nineteenth century New England, where men took aim at a wild turkey in the fields with the winner usually winning a turkey as his prize for marksmanship. Most immigrants celebrate thanksgiving meal interwoven with culinary tradition of their heritage. 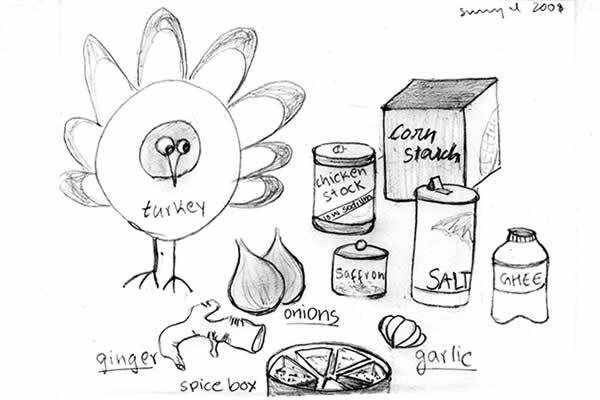 North American bird, turkey, symbolizes their new home in America, while the additional spices and dishes represent their contribution to the melting pot. They add spices or dish distinct to their thanksgiving meal. This practice of bringing culinary heritage to a foreign tradition continues as immigrants from all over the world embrace the United States as their new home. Pakistani families may add garam masala in their turkey, their Thai friends may flavor side dishes with coconut milk, while their Norwegian neighbor may bring smoked salmon appetizer. Likewise, my thanksgiving turkey would be tandoori turkey with saffron gravy. After removing packaging materials and other organs (gizzards etc.,) coat the inside cavity of turkey with spice paste. Pour ½ of chicken stock in there. Stuffing a turkey is not recommended for both food safety as well as taste safety. Make stuffing in a pan as casserole instead. My favorite tip for moist turkey breast comes from Harold McGee. Few hours before the end of thawing the turkey, selectively put ice-packs on its breast. Due to the difference in temperature between breast meat and turkey, the turkey breast will cook slower than the rest of turkey. This will prevent drying of turkey. Be sure to remove the ice-packs before baking. With your fingers and/or flat plastic spatula separate the skin from the breast meat. Be gentle and don’t tear the skin. 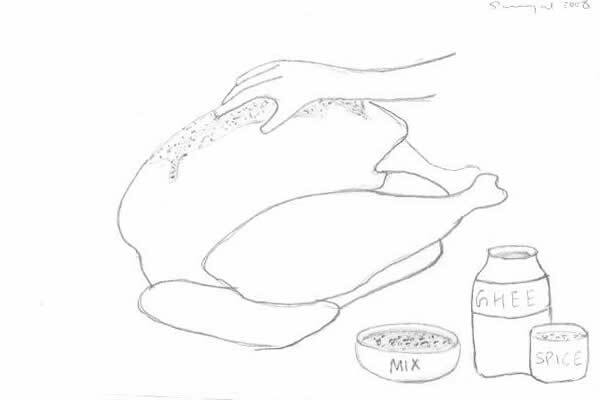 Rub the spice mix in between turkey skin and the breast meat. Rub the spice mix outside the entire turkey. Add chicken stock and sliced onions to the roasting pan. Cover the breast with a sheet of aluminum foil. Roast in 325 °F oven. Remove the foil ½ an hour before the roasting ends. Covering the breast with a foil sheet also helps in preventing the breast from drying. 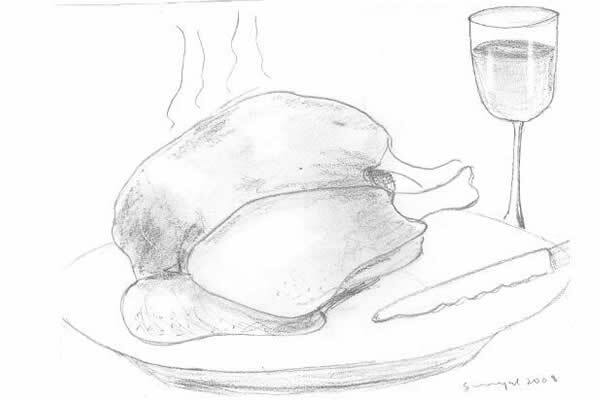 USDA recommends (see USDA’s turkey cooking recommendations) the minimum internal temperature of 165 °F for food safety. Nowadays, many turkeys come up with “pop-up” temperature indicators. However, just to be safe, use instant read thermometer to check temperatures of innermost parts of the turkey, such as thigh, wings, thickest part of the breast. Check doneness of turkey early and often. Leave a dozen inch long strands in milk sometime after putting the roast turkey. The amount of saffron depends on its quality. After removing turkey, pour out the dripping from turkey. Blend mushy roasted onion with other liquid drippings. Mix corn starch with the saffron milk and pour over blended turkey drippings. Reheat until thickens. Gravy done. Thanksgiving is an American celebration of sharing the ample of wholesome, often simple, foods any way you like it. Elizabeth Pleck, “The Making of the Domestic Occasion: The History of Thanksgiving in the United States,” Journal of Social History Vol. 32, No. 4, Summer, 1999, Page 773-789. Janet Siskind, “The Invention of Thanksgiving: A ritual of American nationality”, Critique of Anthropology, Vol. 12, No. 2, June 1992, Page 167-191.